The Alternative Maternals exhibition challenges the perception and dismissal of the mother as an anchor for artistic expression. Through a variety of media—from film and performance art to installation and object-based work—the exhibition provokes thinking about becoming, being and having a mother. The maternal body, dialogue, work, love, and loss enmesh in the work of the exhibit's seven artists to reveal what we have too long taken for granted. For Alternative Maternals, I created (w)hole, a meditation on my 89-year-old mother’s passage through dementia, employing photographs and possessions she found meaningful. The photos show my mother, a former maternity nurse, and a realistic doll to which she became attached. To symbolize her increasing confusion, I altered the photos by stapling, sewing, lacing, piercing and peeling them, as well as by slicing some apart and weaving them back together. The prints are mounted in thrift-shop frames of a type my mother always liked, and rest atop a white dresser. 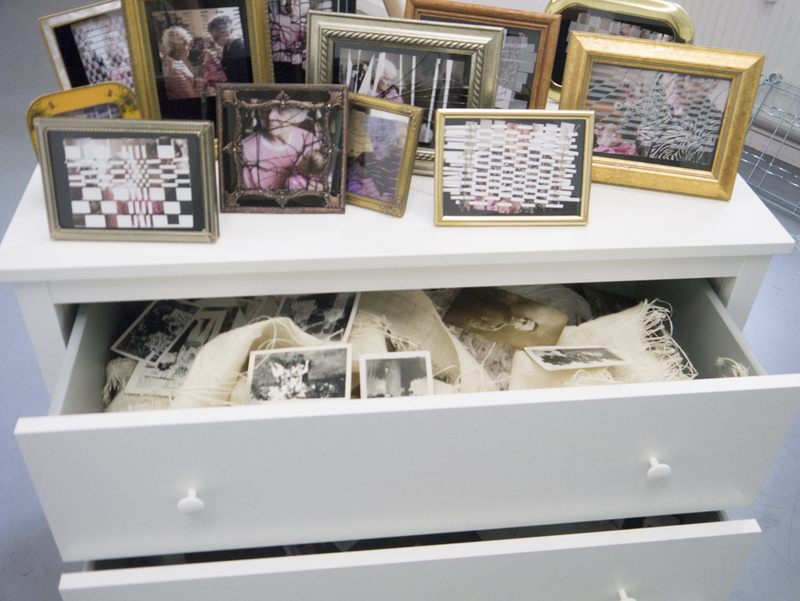 The drawers display in a disordered state objects representing possessions she valued. (W)hole is also an exploration of the relationship in which children of aging parents increasingly find themselves as their parents live beyond the point they can care for themselves, becoming, like small children, the responsibility of their own children, now adults.